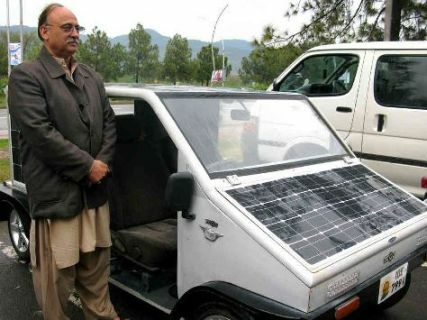 An entrepreneur in Islamabad has built a solar car that can run at 80 km/hour and has a range of 80 km. 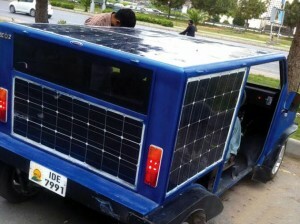 The car has solar panels on all its sides and roof which provide the energy to run the car. The car can also be plugged into an electrical socket to charge the batteries when they get discharged and solar energy is not available. According to the the designer all components have been locally manufactured except for the motor which has been imported from overseas (and obviously panels must have been imported as well). The current version of the car is a 2-seater but a 4-seater is also under construction. The car is registered in Islamabad under the local laws. The company that invented this car, known as Economia, wants to commercialize this car by offering it has an alternate to taxis running on CNG and/or fuel. The company has submitted a proposal to the Government of Pakistan to allow it to start a local taxi system in Islamabad with 30-40 taxi stands in important areas of the city. This is a very encouraging development but it remains to be seen if it is able to taste commercial success. According to the specs provided on the website the 2-seater version runs on a 2.2 KW motor whereas the 4-seater version runs on two 2.2 kW motors. The operating voltage of the motor and batteries is 48 V. The car is expected to be highly efficient and cost only Rs. 1/km. The price of the different versions range from Rs. 350,000 to Rs. 525,000. 1. Input of 2.2 KW at 48 Volts means the motor needs 45 Amps to run. 2. If the solar panels on the car are about 500 W (100 W for each side and 100 W for the roof) the car would need to charge for about 4.4 hours in the sunlight to provide 1 hour of drive time. Realistically speaking, the 500 W panels would be producing only half the rated power since they cannot all be aligned to the sun at the same time. 3. Assuming that when the batteries are fully charged they can provide 2.2 KWhr of energy or simply 2.2 KW for one hour. At Rs. 15 per unit the cost for charging the batteries from an electrical outlet comes out to be Rs.33. Now if this car is able to drive for one hour at 60 Km/hour the cost per km would be Rs. 0.55 (this is assuming 100% efficiency which is practically not possible). Posted in In The News. Tagged Car, Fuel Efficiency, Hybrid, Solar, Solar Energy.